Threats to terrestrial biodiversity include the increasing pressure on forest cover and water resources as the local human population has increased 800% over the past 60 years. In addition, the Timor deer population, the preferred prey source for the endangered Komodo dragon, is still being poached. Destructive fishing practices such as dynamite-, cyanide, and compressor fishing severely threaten the Park's marine resources by destroying both the habitat (coral reefs) and the resource itself (fish and invertebrate stocks). The present situation in the Park is characterized by reduced but continuing destructive fishing practices primarily by immigrant fishers, and high pressure on demersal stocks like lobsters, shellfish, groupers and napoleon wrasse. Pollution inputs, ranging from raw sewage to chemicals, are increasing and may pose a major threat in the future. Today, the PKA Balai Taman Nasional Komodo and PT. 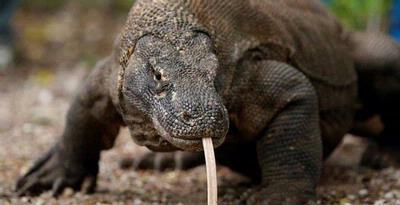 Putri Naga Komodo are working together to protect the Park's vast resources. Our goals are to protect the Park's biodiversity (both marine and terrestrial) and the breeding stocks of commercial fishes for replenishment of surrounding fishing grounds. The main challenge is to reduce both threats to the resources and conflicts between incompatible activities. Both parties have a long term commitment to protecting the marine biodiversity of Komodo National Park. Many things that you can see and do here. An amazing experience when you see the dragons up close in their natural habitat along with a guide of course. On the island of Rinca, you can see the dragons lay outside the national park rangers or lying near a house officer. Previously, to be able to see the dragons, you have to give a goat to attract the attention of the Komodo dragon, but it is already prohibited at this time. If you do not get to see the Komodo dragon, the island of Rinca and Komodo has beautiful scenery with white sandy beaches, mangrove forests, savanna grasslands, and crystal clear blue beaches. Here also you can do the activity of others such as diving and snorkeling. You can also go out to sea by sailing ship or boat fishing. Some suggested dive sites is Red Beach, Batu Bolong, and the island of Tatawa. On Red Beach you will enjoy the beautiful beaches of pink sand. When the waves swept the sand color turns pink widened. The beach is like it is estimated there are only 7 in the world. Coral reefs under the sea is amazing because it occupied a variety of colorful fish such as bat fish, butterfly fish, and clown fish. The amount is estimated at 1000 species of fish, 260 species of coral reefs, and 70 species of sponge. How, interested? When you are in the boat do not be surprised when greeted by dolphins, even if lucky you can see green sea turtles or whales swim in these waters. If you want to see thousands of bats then you can stay in a motor boat in waters near the island of Rinca Island Bats. Here is a description of nature in Komodo National Park. Animals that live in the Land On this island the animals that live on land much smaller than the sea animals. However, even on land inhabited by few species of animals but it is a habitat for unique animals dragons. Many also have the typical mammals such as deer, pigs, monkeys, and ferrets. Some reptiles and birds are similar as found in Australia. Scrubfowl including orange-legged, lesser sulpher-crested Cockatoo, and nosy friarbird. Reptiles other than snakes dragons are 12 species that live inland island. Including the cobra (Naja naja sputatrix), Russel's pit viper (Vipera russeli), and a poisonous green tree snake (Trimeresurus albolabris). Lizards include 9 skink species (Scinidae), geckos (Gekkonidae), not limbed lizards (Dibamidae), and lizard (Varanidae). Frog species like the Asian Bullfrog (Kaloula baleata), Oreophyne jeffersoniana, and Oreophyne darewskyi. They can usually be found in the humid highlands. Mammals include timor deer (Cervus timorensis), the main prey Komodo dragon, horses (Equua sp. ), Buffalo (Bubalus bubalis), boar (Sus scrofa vittatus), long-tailed monkey (Macaca fascicularis), palm civet (Paradoxurus hermaphrodites lehmanni ), mice that are only found in the island of Rinca (Rattus rintjanus), and fruit bats. You can also find goats, dogs, and cats. Bird is one of the major species here. There scrubfowl legged orange (Megapodius reinwardti), birds that live on land. Savanna grasslands in the region there are 27 species that you can observe. Geopelia striata and Streptopelia chinensis were the most abundant species encountered. There are also 28 species of birds, Philemon buceroides, Ducula aenea, and Zosterops chloris the most frequently encountered. Marine Physical EnvironmentMarine areas form 67% of the national park. Open water in the national park has a depth of 100 and 200 m. Strait Rinca and Flores and Padar and Rinca, are relatively shallow depth of 30 to 70 m, with a large current. The combination of heavy currents, rocks and small islands to the islands around Komodo Island is difficult to reach and dangerous. Within the safe harbor contained in the bay Loh Liang on Komodo Island's east coast, southeast coast of Padar, and bay Loh Kima and Loh Dasami on Rinca. In the northern part of the national park, the water temperature ranges between 25-29 º C. In the middle, the water temperature ranges between 24 and 28 º C. Lower water temperatures in the south, ranges between 22-28 º C with a salinity about 34 ppt and the water was quite clear even though the water is close to the island a little murky. Marine EcosystemsIndonesia is the only area through which the equator in the world where there is exchange of marine flora and fauna between the Pacific and Indian oceans. Corridor in East Nusa Tenggara (formerly Leusser Sunda islands) between the Sunda and Sahul transfer delay between the Pacific and Indian oceans. Three main ecosystems in Komodo National Park is the expanse of ocean, coral reefs and mangrove forests (mangroves). This is a park nansional cetacean migration path. Sea vegetablesThree main flora in the sea are algae, sea grass, and mangroves. Algae are primitive plants that have no roots, leaves, and stems. The composition of the important reef algae are coralline red algae that secrete a hard limestone skeleton that can embed mengerak and dead coral. Or seagrass Seagrass is a modern plant that produces flowers, fruit-stage, and seeds for reproduction. As the name suggests, the shape of seagrass as a large grass that grows under the sea in the sand near the edge of the sea. Thallasia sp. and Zastera spp. is the most abundant species found in national parks. Mangroves can live in salty soil or water and can be found throughout the park. Identified at least 19 native species of mangroves and some other mangrove species in the national park boundary. Sea Animals Komodo National Park is included in one of nature's richest seas in the world. Marine life in this park were as many as 259 species of coral and 1,000 species of fish such as barracuda, marlin, yellow tail, red snapper, rabbitfish. Here you can find foram, cnidarians, including more than 260 species of coral reef structure, about 70 species of sponges, ascidians, marine worms, molluscs, echinoderm, crustaceans, cartilaginous, and bony fish more than 1,000 species, marine reptiles, and marine mammals such as dolphins, whales and dugongs. Some important species of commercial value is the sea cucumber (Holothuria), Napoleon wrasse (Cheilinus undulates), and fish such as sardines group.